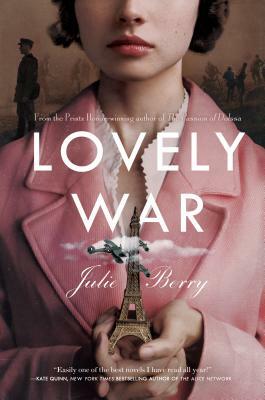 Tuesday, April 2nd, 2019, 6 p.m.
Printz Honor winner Julie Berry visits Gibson's Bookstore to share her new young adult novel Lovely War, a sweeping, multi-layered romance set in the perilous days of World Wars I and II, where the Greek gods hold the fates--and the hearts--of four mortals in their hands. “An unforgettable romance so Olympian in scope, human at its core, and lyrical in its prose that it must be divinely inspired.” Kirkus, starred review. About the author: Julie Berry is the author of the 2017 Printz Honor and Los Angeles Times Book Prize shortlisted novel The Passion of Dolssa, the Carnegie and Edgar shortlisted All the Truth That's in Me, and many other acclaimed middle grade novels and picture books. She holds a BS from Rensselaer in communication and an MFA from Vermont College. She lives in Southern California with her family. From the Printz honor winning author of The Passion of Dolssa, a mesmerizing story about fear, love, and the power of a young woman's voice.